Fly a flag outside that really shows your beliefs! 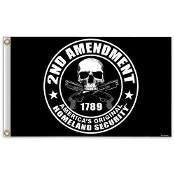 This flag looks great on a flagpole, flying behind a truck on a whip antenna or flapping in the wind on your bike. Constructed of 100% polyester. 3' X 5'.